After coming out swinging a few days back with a Surface ad that focused on Office, Microsoft has a new ad that confronts the iPad head-on. And here’s the crazy part: it’s surprisingly amusing. The commercial is a takeoff of Apple’s iPad Mini piano commercial. In the Microsoft version—entitled “Windows 8: Less talking, more doing”—the company pokes fun at Apple’s personal digital assistant Siri, all the while showing off the advantages of a Windows 8 tablet over the iPad. “Sorry, I don’t update like that,” Siri says when the disembodied hand often seen in Apple commercials tries to get Live Tile updates from the iPad’s grid of icons. “Sorry, I can only do one thing at a time,” Siri chimes in again while a Windows 8 tablet shows off the Snap feature that lets you view two apps at once. Finally, in what sounds like a moment of digital exasperation, poor Siri says, “I guess PowerPoint isn't one of those things. Should we just play Chopsticks?” Fade to pricing. Hey look, the Windows 8 64GB tablet is $250 cheaper. The message is clear: The iPad is a child’s toy next to a full featured Windows 8 tablet running Microsoft Office; it’s cheaper and it’s better. Now, forget all the things that are wrong with this ad. Even though Microsoft hasn’t released the oft-rumored Office for iOS yet, Apple offers its own presentation software—Keynote—that opens PPT files just fine, and the iPad can work with PowerPoint Web apps in a pinch. Also, the iPad is certainly a lot more useful than Microsoft’s portrayal suggests, and it starts at $500, not the $699 mentioned in the ad. The 64GB version is $699, however, and that's how much storage the Asus tablet shown in the clip packs in. But the commercial is amusing and informative about the advantages of Windows 8—and that’s what's effective in advertising. Apple’s “Hi, I’m a Mac” ads portrayed the Windows PC as a product for pencil-pushing buffoons. It was a distortion, but it was amusing and it enumerated many of the Mac’s selling points over a Windows PC. Again, that’s what counts. Microsoft may lose points on originality since this ad is a spoof, but the company’s latest run of commercials is impressive for a firm that has a terrible track record when it comes to marketing. Who can forget the completely meaningless Seinfeld ads that started in 2008 or the oh-so-lame I’m a PC campaign from 2009? 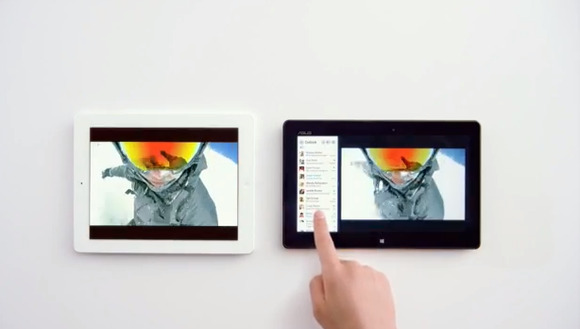 But this iPad vs. Windows 8 ad makes you wonder how long Microsoft plans to hype the iPad as an ‘Office-less’ device. After months of reported sightings and speculation, Office for iPad is rumored to show up in fall 2014, according to ZDNet's Mary Jo Foley. Is Microsoft just trying to get a few digs into its longtime rival before it’s too late, or does this ad suggest a change in tactic that may keep Office off of iOS indefinitely?